I've noticed in my lobster roach colony that a few of the dead adult and sometimes juvenile roach corpses I find have a bright redness to their legs and mouth area. I don't know if this is the cause of death, but I'm finding more and more cavaliers like this. Any idea on what it is? I've had many like that also. At first I thought it was the UVB I am using for my bearded dragon. I believe it's just the way they rot under certain conditions. So, what exactly is the red then? So it's rot? Some of them were still alive and I noticed the red. It must have a smell because my BD won't eat them if they are red. The same thing happened among my hissers..and now they are all gone. I alsaw find few cases in my cricket colony. I wont to know what this is so i can prevent it. I've seen it a few times on dead or dying hissers (animals can have parts of the body die well before the creature dies) in a healthy colony that has been around forever. As Blay mentions, the same discoloration shows up on crickets, and I've seen it on Nauphoeta cinerea. 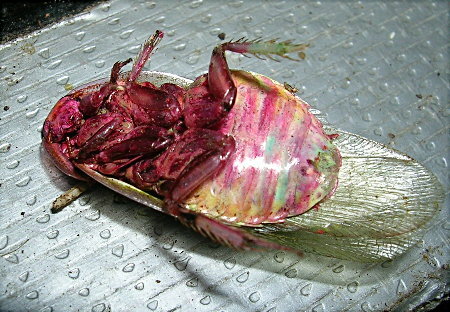 I'm pretty sure it's just a discoloration of the rotting exoskeleton (and innards). If there are bad conditions causing a lot of animals to die and the humidity is just right it may show up as a symtom of old animals or bad conditions, but it's not a cause. If there is a really serious case in the colony, clean the bin, use new substrate, clean or replace the objects they climb on, and destroy any corpses or live individuals with reddish color so other roaches do not nibble on infected tissue. The remaining roaches should recover very quickly. So do you know if the "red" comes from the cell death by a secreation (something like the aerolysin cytotoxic enterotoxins) or is it something totally different? Here's a picture of a P. nivea that just happened to die under the water dish and turned quite a bright red. It's not a disease and did not 'spread' to any other members of the culture. Wow i've never seen that happen before, guess thats a good thing though. It is a pigment by-product produced by the bacteria as they break down the organic matter. It does not 'spead' in a colony so much as it is usually present or not.